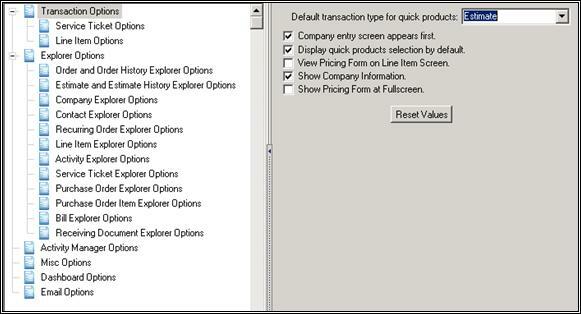 Default Transaction Type for Quick Products: Designate the Quick Products you want members of this group to see when they initially log in to Control. Company entry screen appears first: Check this box off if you want the company screen to pop up before you enter Quick Products to an order. Display quick products selection by default: Check this box off if you want the Quick Products selected to appear for the User. View Pricing Form on Line Item Screen: Check this box if you want the pricing form to appear when adding line items to an order. Show Company Information: Check this box if you want to see company info when creating a new Quick Products order. Show Pricing Form at Fullscreen: Check this box if you want the pricing form to show at full screen. Reset Values: Click this button to cancel all changes. Move Up: Moves the selected item in the list up. Demote: Demotes the selected item in the list. Close: Closes an unedited screen. Edit: Enters a mode that allows previously saved information to be changed.